Central government should bring a comprehensive national employment policy to integrate key investments in core sectors to concentrate on job creation while state governments should formulate flexible education, skill development and introduce innovative methods to create jobs. As change is a constant, so is employment generation for the 130 billion plus populated country. An average eight lakh workers are being added each year in the country. Demographically, according to statistics, working age group of 15-65 years consist 66 per cent of the population. Hence, employment for all poses a big challenge for the State. Of these, farm sector still commands the job market with nearly 50 per cent of the employment in the sector. Most of the organised jobs are sponsored by the manufacturing sector. Economic Survey 2016-17 mentioned that the organised job market has indeed created much jobs with four lakh opportunities during the year. Demonetisation had both an intensive and extensive impact. 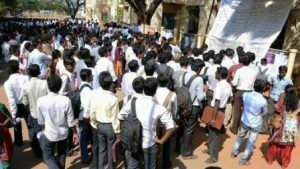 The controversial leaked NSSO survey gives an alleged stupendous fall in the employment situation amidst wider allegations that current growth trajectory is a ‘jobless growth’. Also read: Quota Bill: Can reservation alone help fight unemployment? Immediately following Independence, Jawaharlal Nehru as a visionary preferred a development strategy based on large-scale industrialisation. Though the country lacked necessary advanced technological back-up for such a vision, Nehru built dams and large-scale industries with collaboration from developed economies. Interestingly, during the early 1950s, the then Chief Minister of Madras Presidency, C Rajagopalachari, brought a plan to impart vocational training in schools to allow students to further their family profession. It was strongly opposed, and subsequently he lost his post. Vocational and technical education for the masses was widely lacking which put undue pressure on the education system to deliver best students for clerical jobs. Later in the 1980s, there was an emergence of professional educational institutions and it led to the creation of IT sector and digital revolution. Today, once again, the segmentation of employment has been described as overwhelming. Irrefutably, the job profile of the country has been diverse. Both modern and older economies include tremendous potential to grow. However, an integrated policy is not there in place to guide the economy. Private sector has to strategise their own initiatives while the State tries to address the agrarian economy through schemes like MGNREGA. ‘Pakodas’ debate unwisely illustrated that self-employment is ‘downgraded’. In a pragmatic way, skill development and training with stipend schemes are being promoted. Incubation centers and entrepreneurship through ‘Start up India, and Stand up India’ initiative has been undertaken by lakhs of people. Women’s participation in the economic activities has in fact created a competitive and complex scenario while in the traditional economy, their role was restricted to household and selective engagement in farm sector. In hindsight, self-employment “Mudra” scheme has made an inroad with more than 14 crore beneficiaries. 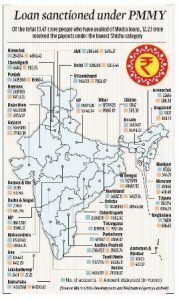 Out of them, 12 crore have taken a loan of Rs.50,000 to start tiny businesses. Women top the list of beneficiaries with 75 per cent. Curiously, the widely ignored issue is the lack of curriculum in education to create an environment of employability among the students. Still, state governments have to come out of the hangover of traditional outlook on education. Some states like Tamil Nadu have started to encourage scientific temper in schools by conducting exhibitions and competitions to explore the best talents within individual students. Failure in changing curriculum according to the changing times finally ends up like pandemonium in the Parliament. Central Government should bring a comprehensive national employment policy to integrate all strategic investments in core sectors to concentrate on job creation. State governments should visualise their potent contribution by formulating flexible education, skill development and introducing innovative methods in creating supportive environment towards employment generation. In modern economics, unemployment and jobless growth are cyclical processes. But crises also create opportunities as evident from the developed markets which India is also determined to follow.